But in the same vein, it does open your eyes to why some things fetch some sums and why they’re worth the prices paid for them. As with most people, there are a few things I don’t scrimp on – handbags, jewellery, beauty products and home accessories. If it looks expensive, that’s because it is, and with good reason. 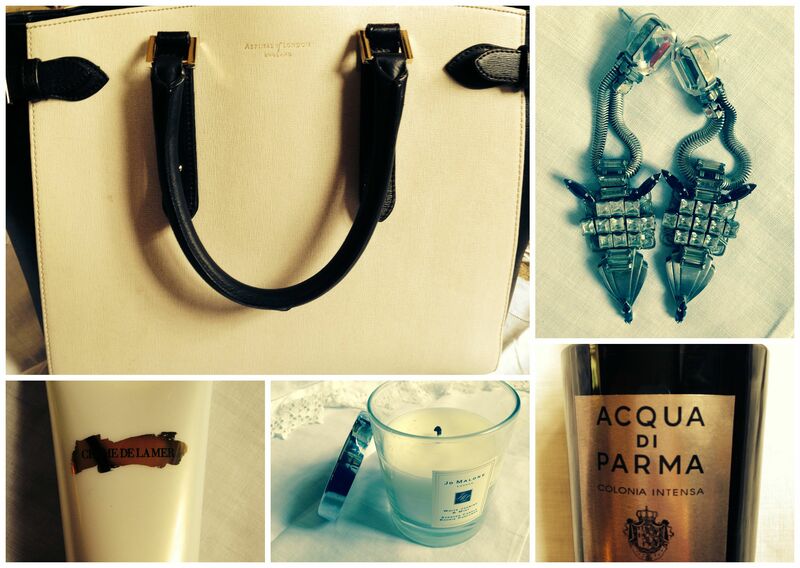 Here are my best beloved luxury items, ones that I’ve spent decent money on, and would – and sometimes do – again. 1. Marylebone Tote in Monochrome Saffiano, from £895, Aspinal of London: This bag achieved a much sought-after cult status when it was released a few years ago. The oversized tote, beautifully constructed with interior padding for iPads and small laptops, personalisation options and a range of colours and materials was seen on the arm of Kim Sears, amongst others and soon became incredibly popular. I lusted after mine for two years before taking the plunge. And I don’t regret it. I used it every day for a year and it still looks new. Now I take it out when I’m out without Munchkin and it feels special and glamorous all over again. My pick from this year’s range is the gorgeous Burgundry Python, but at £1500, you’ll need to really love it. 2. Statement Earrings, from £295, Erickson Beamon: This is a real case of something looking and feeling what it’s worth. Every time I wear these, people comment on them, they stand out, they make a statement, but they sit really well in my ears and they don’t pull after hours of wearing. I use them for every special occasion I can. I love the bold design and the how unique they are. Erickson Beamon are some of my favourite jewellery designers, real masters of their craft. 3. Colinia Oud, £150, Aqua di Parma: £150 for something that fades after several hours of wearing? Really? Yes. Absolutely. I bought this for R for Christmas last year and it is sublime. It smells so expensive and rich and deep and musky, it is the epitome of a manly scent that oozes yumminess. I hope it never runs out. 4. White Jasmine & Mint, £42, Jo Malone: I’ve written before about how much I value a good scented candle, and Jo Malone are about the best there is around. The scents are always interesting, rich but fresh and they really add to a room. I’m a fan of their renowned Pomegranate Noir, and the White Jasmine & Mint I was treated to for my birthday is also a real favourite, but without doubt the most heady of their candles is Incense and Embers, sweet and smoky it’s so comforting and homey. Gets me everytime. 5. Gradual Tan for Face & Body, £60 for 200ml, Creme de la Mer: This is actually a case of thinking this is cheap for how good it is. And considering most Creme de la Mer products come in at over £200, this incredibly good value. I don’t buy anything else to get me through the summer months with a season-long tan. One tube last for four or five months, and can be used all over your body, and face, for an effortless tan. I chuck it on in the morning, let it dry for ten mins, maybe less, and then head out for my day. The colour is so subtle, but warm too, and not at all orange. Best bit – it smells amazing, not a hint of stale biscuits.